Lee Turner Friedman is a civil litigator with a focus on complex commercial disputes, False Claims Act investigations and qui tam suits, and antitrust litigation. Lee has handled civil cases in state and federal courts around the country. 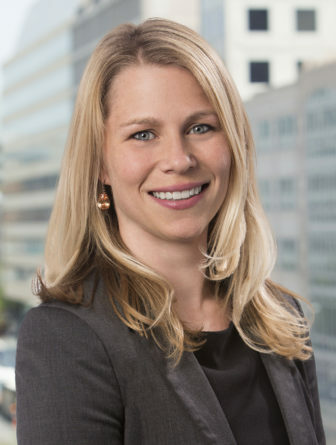 Her cases have spanned a wide range of industries and legal issues, including price-fixing and monopolization claims in the agricultural and pharmaceutical industries; First Amendment challenges to a food labeling law; challenges under the False Claims Act and securities laws related to a hospital companies’ admission practices; and breach-of-contract, tort, and employment disputes in the insurance, financial, and real estate investment industries. In addition to her trial-level work, Lee has briefed numerous appeals in the Second, Fifth, and Sixth Circuits, and the D.C. Court of Appeals. In 2017, Lee obtained reversal by the D.C. Court of Appeals of her pro bono client’s criminal convictions because the convictions were based on a stop and search that violated the Fourth Amendment. Lee also has significant experience representing companies in the defense sector in connection with both internal and government False Claims Act investigations and qui tam lawsuits. Lee joined Robbins Russell in 2014. Before that, she was an associate in the New York office of Quinn Emanuel Urquhart & Sullivan LLP. She clerked for Chief Judge Carol Amon of the United States District Court for the Eastern District of New York and for Judge Rosemary Barkett of the United States Court of Appeals for the Eleventh Circuit. Representing real estate investment firm in negligence suit against neighboring developer and construction firms to recover for significant property damage and related losses arising from catastrophic structural collapse. Defended Fortune 500 insurance company in multiple breach-of-contract and fraud class actions concerning premiums for workers compensation insurance. Represented asset management company seeking to recover $100 million in unpaid fees for services rendered to a telecommunications company. Defending Fortune 500 pharmaceutical company against antitrust claims brought by competitor concerning marketing of pharmaceutical products. Defended manufacturer of fire safety systems in antitrust action brought by terminated distributor. Obtained dismissal of all claims. Represented direct-purchaser plaintiffs in antitrust class action alleging that producers and trade groups conspired to restrict the domestic supply of eggs and egg products. Defended Fortune 500 company against qui tam lawsuit alleging that company earned excess profits in connection with contract with Department of Homeland Security. Obtained summary judgment on all claims. Assisted major defense contractor in connection with multiple civil False Claims Act investigations by the U.S. Department of Justice, U.S. Attorneys’ offices, and other federal agencies. Defended Fortune 500 healthcare company against a $900 million securities class action and derivative shareholder action premised on alleged violations of the False Claims Act, with primary responsibility for preparing corporate witnesses deposition testimony. Obtained full reversal by District of Columbia Court of Appeals of client’s armed robbery conviction on the ground that the stop of a vehicle in which client was a passenger violated the Fourth Amendment. Defended GMO labeling law against constitutional challenges brought under the First Amendment and Commerce Clause.